TORONTO, January 29, 2019 – At a time when companies in the creative industries face increasingly complex business challenges, driven by changes in technology, media consumption and consumer preferences, top talent is essential to helping them navigate the evolving landscape and develop solutions that help build brands, generate revenue and stay ahead of the competition. 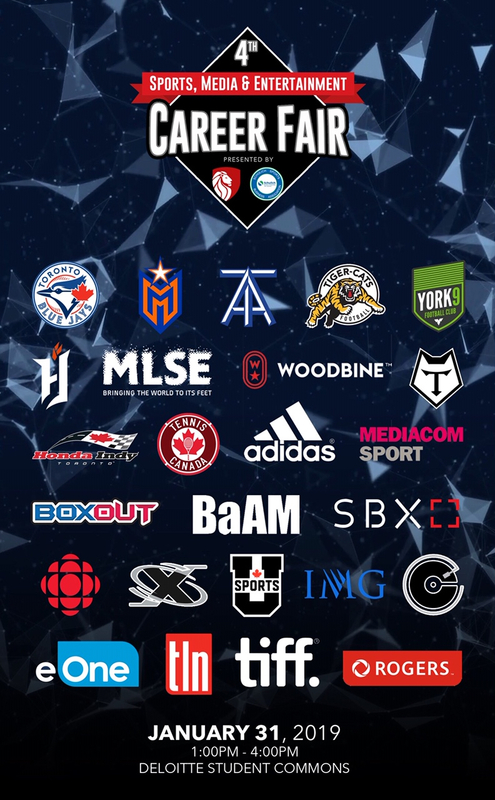 The fourth annual Sports, Media & Entertainment Career Fair at Schulich School of Business is the only event of its kind in Canada and will showcase career opportunities in the ultra-competitive, and passion-driven creative industries. It will provide students with access to a variety of opportunities (i.e. summer internship, contract, entry-level and leadership development programs) at some of the leading companies in Canada. For Schulich students, the Fair represents a real and tangible link between academia and career opportunities. This year’s edition is poised to set a Fair record with 24 companies expected to participate. MLSE, TIFF, adidas, Entertainment One, IMG, Tennis Canada, Rogers Media and Woodbine Entertainment are some of the industry-leading companies showcasing opportunities across various functions including Accounting, Finance, Marketing, Business Development, Analytics/Business Intelligence, Administration, and more. The Fair’s founder, Schulich School of Business Marketing Instructor Vijay Setlur, is available for interviews.